The CCATF is a cross-industry initiative designed to increase employer engagement in apprenticeship training. Since its inception in 2007, the CCATF has adopted a two-pronged approach: firstly, to communicate positive messages to employers regarding training and apprenticeships and secondly, to influence government policy to ensure we create the best environment for construction apprenticeship training. Influence changes to government allocation and funding arrangements, which currently make it harder for colleges to help a student leave a full-time course in order to start an apprenticeship. Increase opportunities for employers to participate in work experience or traineeship programmes. Support the development of a comprehensive training provider and course availability database. Support the development of qualifications that meet the needs of employers in the construction industry. Lobby for the provision of free trainee cards from Card Schemes for apprentices. Encourage the positive promotion of careers in construction. Work with government to improve the quality of apprenticeships so they are used and valued by even more young people and employers, teachers and parents. 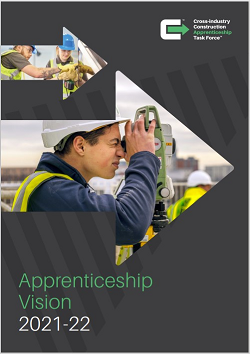 In order to obtain your copy of the Apprenticeship Vision 2018-19 (PDF, 2MB) and learn more about the CCATF, and the work it does supporting Apprenticeships in the UK construction industry, follow the link and provide us with some basic contact information. You individual copy of the Annual Report will be emailed to you shortly.